Columbus, OH – The Jazz Arts Group of Columbus (JAG) has announced its winner of the 2018 Hank Marr High School Jazz Award – 17 year-old trumpeter Charlie Merk. The award demonstrates excellence in musicianship and performance amongst Ohio’s young students of jazz and comes with a cash prize of $500 and an opportunity to perform with the Columbus Jazz Orchestra, led by Byron Stripling, on the July 20th, 2018 JazZoo concert at the Columbus Zoo and Aquarium. Merk was one of three young performers to make it to the finals of the competition which began with a first-round blind audition process adjudicated by Ryan Hamilton, professional trombonist and professor at Capital University; Ben Huntoon, trumpeter and Jazz Education Specialist at Stanton’s Sheet Music; and Dave Powers, pianist and Adjunct Professor of Jazz Studies at The Ohio State University. Students in the first round represented four different Ohio counties – Butler, Delaware, Franklin, and Hamilton. The other finalists were Samuel Breadon, guitarist, a senior at Walnut Hills High School in Cincinnati; and Lorenzo Monk, pianist, a graduate of Olentangy Orange High School in Lewis Center. Adjudicators for the final round of the competition were Tom Carroll, guitarist, retired Professor of Music, Denison University; Kevin Turner, guitarist and Adjunct Professor at Ohio State University and Ohio Wesleyan University; and Michael Cox, saxophonist and Professor of Saxophone at Capital University. Columbus music legend Hank Marr was one of the world’s masters of the Hammond B3 organ. Along with Hank’s celebrity status as a member of the jazz elite, he was a dedicated and gifted educator. In recognition of over fifty years as a performer, teacher, arranger and conductor, the Jazz Arts Group established the Hank Marr High School Jazz Award as a tribute to this special individual. His willingness to “pass it on” makes the encouragement of young jazz artists an important and meaningful activity. Support for the Hank Marr High School Jazz Award comes from Crabbe, Brown, and James, Jamey Aebersold Jazz, Stanton’s Sheet Music, and Jazz Education Connection of Ohio. Additional support comes from individual contributors who knew and loved Hank Marr. Charlie Merk is a trumpet player from Lakota West High School. He has been a member of the 2017 and 2018 Ohio Music Education Association (OMEA) All-State Jazz Ensemble as well as a five-year member of the District XIII Honor Jazz Band. He has also been featured in several local jazz combos and Prep Jazz Bands for the College-Conservatory of Music at the University of Cincinnati. Lorenzo Monk is an 18 year-old senior at Olentangy Orange High School. 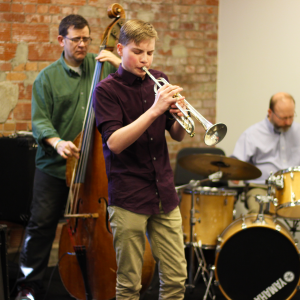 He has been a member of the Columbus Youth Jazz Studio Ensemble for two years. He started out in music playing the drums and began playing piano when he was 14 years old. Monk joined the Olentangy Orange High School jazz band his freshman year, and plans to attend Oakwood University in the fall where he will major in music. Some of his other interests are track and field and film studies. Sam Breadon developed a love for music at an early age. He saved his money and bought his first guitar at age ten. Breadon began lessons two years later in the sixth grade, learning mainly rock & roll and blues. He soon discovered he had a passion for improvisation which led him to explore the world of jazz. In the ninth grade, he joined the jazz band at Walnut Hills High School and started playing in combos both inside and outside of school. He has been very fortunate to play with many local professionals as well as many talented young musicians. Breadon is passionate about and very dedicated to the understanding and evolution of jazz and plans to attend the University of Cincinnati, College-Conservatory of Music to major in music education and jazz studies. The Jazz Arts Group of Columbus (JAG) is America’s premier not-for-profit arts organization dedicated to producing, performing and promoting jazz. JAG is the third largest performing arts organization in Columbus and consists of four focus areas: the Columbus Jazz Orchestra (CJO), one of the world’s finest professional jazz orchestras; the Jazz Academy, JAG’s extensive instructional programs educating both students and adults about jazz and American music; Jazz Arts Group Presents, a jazz and blues performance series produced at the historic Lincoln Theatre; and Affiliate Musicians, a program providing employment opportunities for professional musicians.